Last week I had friends visit from Ottawa (not just to see me, tho: they’ve gone on an Alaskan cruise) and we spent a few days in Tofino. 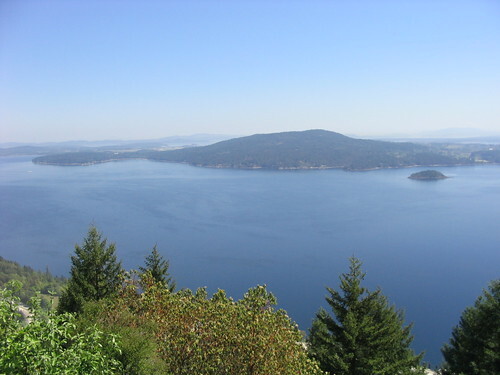 I picked them up at the airport Monday evening, and we headed down to Tsawwassen to take the Victoria ferry. We spent most of Tuesday traveling across the island; we could have done it in a few hours, but why rush? There was so much to see on the way. In Duncan, we stopped at the Quw’utsun’ Cultural Centre, where we looked at some totem poles and watched an interesting short film on the Cowichan people’s history and culture. Petroglyph Park was a bit of a disappointment, though—maybe I didn’t look in the right places, but the glyphs just weren’t that visible. it’s possible I was expecting big showy art like Cro-Magnon cave paintings. 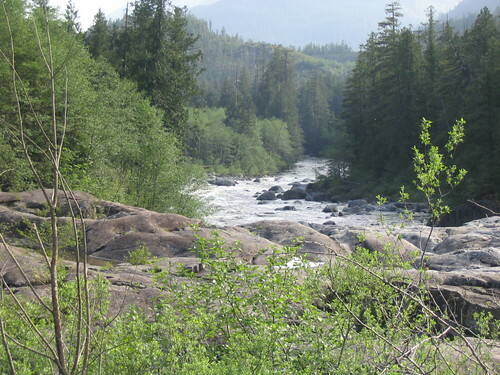 Oh, well; maybe I’ll give it (or other petroglyph sites on Vancouver Island) another go if I’m ever in the area again. Everything else about our trip across the island was stunning, though, from the big mountains to the serene lakes to the little creeks bubbling merrily by the highway. We stayed at the Pacific Sands resort, right by Cox Bay Beach. I took a walk on the beach that night, away from the resort, and was struck by the dizzying and awesome sight of the night sky crowded with stars. Equally awesome: the roaring blackness that was the Pacific, broken only by the foam on top of the waves, faintly reflecting the light from the resort. Having lived in cities all my life, I found such complete darkness disorienting and more than a little scary. On Wednesday morning we took a walk on the beach at low tide and goggled at the stunning critters we found. 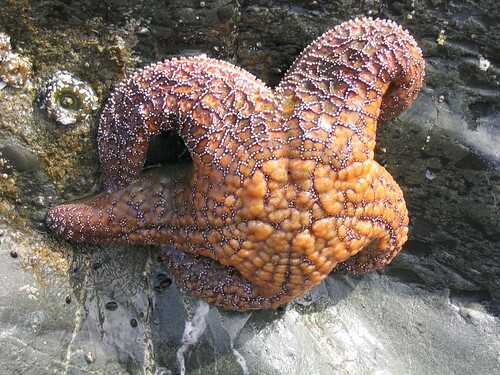 There were big gorgeous starfish, several kinds of sea anemones, mussels, barnacles and more. I’d only thought about tides in the abstract, caused by the motion of the sun and the moon, but here it was real: there was the intertidal zone, covered in barnacles and mussels. This was nature, not in a zoo; powerful, untamed, dangerous and fascinating. Then, whale watching! 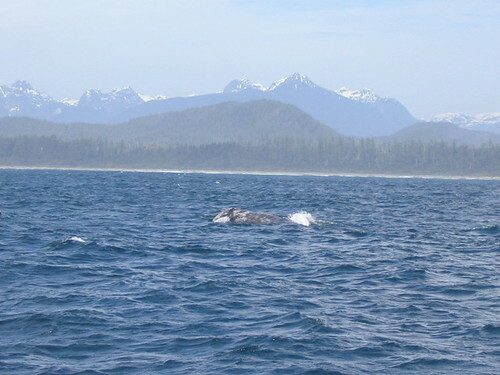 We’d heard that gray whales had been sighted feeding in the area, so decided it was worth the risk of seasickness. I took lots of pictures of the nearby islands as we went past them, for reference. I think in the back of my mind I wanted to piece together a map of the area, and match island names with their actual appearance. 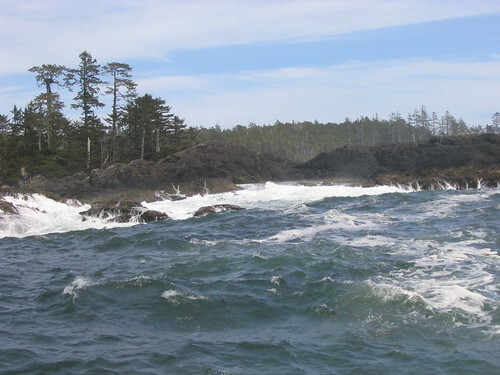 But when I sorted through the pictures later, they pretty much all looked like nondescript rocks rising from the sea. Oh well. I did get a couple of pretty good shots of a gray whale. I was lucky to even get those, because as big as those creatures are (up to 15m), they’re very small compared to the very big Pacific Ocean. Most of the time all I could see was their spout in the distance. The best part was, I didn’t get seasick (though I got pretty worried the first time we cut engines to watch for whales). The credit goes to the two Gravols I took, and also to my always being on my feet and adjusting for the motion of the boat. In fact, I deliberately tried to imagine I was the one controlling the rocking, which I think helped even more. On the way back, the wind picked up and the waves got even worse. But I stayed abovedecks, even though I wore only a t-shirt and light jacket, because I knew if I went below I’d have a much better chance of being sick. I preferred to freeze, endure the wind and the spray (like needles on my face, it was! ), than share my lunch with the fishes. Before docking we passed by a bald eagle’s nest on one of the little islands between Tofino and Meares Island, but it was too far for me to get a clear picture. That’s okay, though: I saw lots of bald eagles (another first for me) soaring majestically around the area. We started back on Thursday, stopping to explore a couple of trails south of Long Beach, ending up in a little sheltered cove. My inner scientist perked right up, because it made an interesting contrast with Cox Bay Beach. 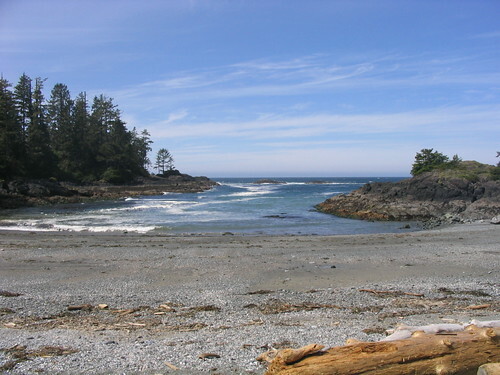 Now, Cox Bay is a sandy beach, very exposed, with no (or very few) off-shore rocks. It has life, but only the kind of life that can hang on to bare rock and endure the strong tides: barnacles, mussels, anemones, starfish. This little cove, on the other hand, was a gravelly beach, and turned out to have much richer life in its tide pools: everything we saw on Cox Bay, plus little fishies, tiny little crabs, more kinds of seaweed and shellfish. They don’t have to fight the ebb and flow so much. I picked up a few seashell fragments, polished by the waves and bleached by the sun, and that was another difference: would shells survive on Cox Beach long enough to be bleached white before being swept out to sea or smashed against the rocks? And that was it. I regret that this is only the second time I’ve been out to Tofino in almost ten years of living in Vancouver. It’s a different place, more relaxed, closer to nature. I’m not sure I could live there long-term, but I treasure the brief times I stayed. And I like to think I’ve brough something back besides souvenirs: in addition to some extra knowledge about the creatures I’ve encountered, I have a greater respect for the vast, uncaring (yet complex and endlessly fascinating) web of relationships that connect them, and me, together.